Rotafix Zeroset Anchor Grout is a 2-part high strength epoxy system which is used for the fixing of metallic objects into concrete such as anchors and studs. Rotafix Zeroset Anchor Grout has been specifically designed for setting at low temperatures in smooth walled, diamond drilled holes. This chemical anchor will displace water from a hole then cure under any residual water. 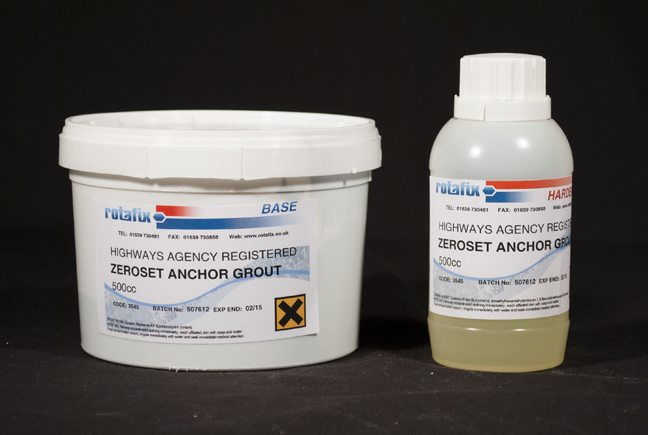 This high-performance chemical anchor grout has been approved by the Department of Transport for parapets and street lighting.